Puerto Rico is an engaging game that really can become quite addictive. It is designed for 3-5 players, of ages 12 and up. Once you have learned the rules, playing time averages 90 to 150 minuets. My wife and I have now played Puerto Rico with two completely different sets of friends, and in both cases our friends have become hooked and are now looking for their own copies of the game to purchase. Part of what makes Puerto Rico a great game is that there is no one way to win. Everyone who has played board games knows that in most cases, there is a single path that the winner must take to achieve victory, and whoever is most successful in accomplishing that one predetermined set of goals will be the ultimate winner. Not so with Puerto Rico. Another positive element in Puerto Rico is that every player has the opportunity to play the various roles that are offered in the game (e.g. Mayor, Builder, Captain, etc.) and to enjoy the privileges that come with playing those roles. This keeps game play fluid and intriguing. Puerto Rico is a game of strategy and economics. There is just enough chance in the game to keep you on your toes and from knowing what will happen, but the goal of winning will ultimately be achieved by the player who has thought ahead and planned their moves accordingly. You have to keep your thinking cap on for this one, folks. 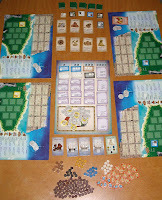 The only difficulty my friends and I experienced in playing Puerto Rico was in understanding from the directions how game play was to begin. The game was originally developed in Germany and I think that perhaps the difficulty was due in some part to translation issues which made the directions somewhat opaque when starting out. However, I have to say that once we figured out how to begin playing, the directions became very helpful as they do clearly answer questions that arise without having to dig through a lot of useless data. Overall, I would give Puerto Rico 9 out of 10. If you would like to play the game, I would also recommend going to the website Board Games with Scott and watching Scott's video on Puerto Rico to learn more. Carrie here again: I guess we can safely say that Rio Grande Games are a hit with our family. So far, no strike outs! While I have not yet convinced my husband to play Puerto Rico with me, we both really enjoy the card game version -- San Juan. It's a bit simplified, and plays faster, and while it can play with more than two, it is a great two-player game as well. Thank you Katrina for the info on San Juan. I will look in to that as I'd love a more intriguing card game that just my husband and I could play. Looks like a fun game. Thanks for the tip. This game was my first strategic board game that i played in my life and i love it alot! I can no longer find any strategical game that is fun and intriguing. 9.5/10 for Puerto Rico!